The following guide will explain how you can file your TDS return online via your ClearTDS dashboard. As well as outline the steps about what needs to be done after you complete filing. If you are looking for steps to prepare your TDS Returns, read this guide. 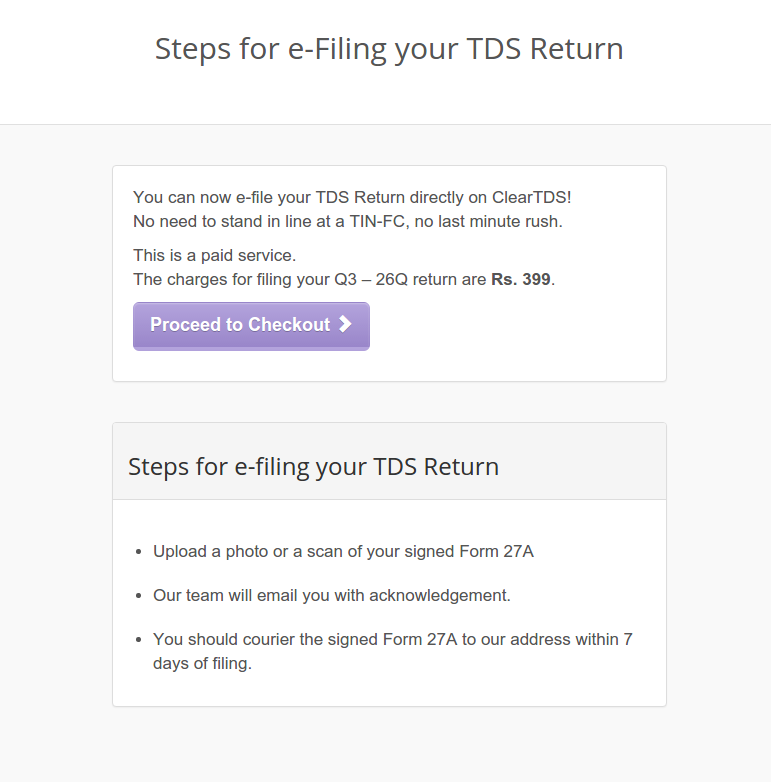 Where and how do I upload my TDS Return online? To start, once you've satisfactorily uploaded your TDS return details, click on Generate TDS Return. After verifying previously entered data, continue to FVU generation. Once your TDS return is ready, you shall notice 2 options on your screen. One, to either download and personally take it to the TIN-FC center. Or to directly file TDS return online. Once you choose to file TDS return online, you'll be asked to pay for the service. Enter your card details to complete the process. What is the process after I've uploaded the TDS return on ClearTDS? What address do I need to courier the hard copy of the TDS return to? What is the pricing for the optional service of filing e-return online? ClearTDS is so simple that you don't even need to read these guides! What happens if I do not file my TDS returns on time? What are the rates at which TDS is applicable? How do I correct form details after filing? Weighed down by too much tax rules, deductions and laws? We'll spare you the headache and give you access to our short and simple guide to tax planning and filing.